Waves of Savings: LED Track Light Kits on Sale Now! All LED track lighting kits are on sale at LEDWaves.com! Today through Wednesday, March 26th 2014, use coupon code WAVES for 15% off all Flex II 12v LED track lighting kits. The Flex II kit ships with a 10 ft. track you can cut and bend to your specifications, matching 12v spotlight fixtures & mounting hardware, and your choice of dimmable or non-dimming 12v power supply & LED light bulbs. They’re a great way to modernize your space with overhead lights – without bashing holes in the ceiling. Hilfman Music recently added a couple of Flex II kits to their new 800 sq. ft. studio in Southern California. We love how the track weaves around the sound proofing near the ceiling. The light fixtures can be adjusted manually to spotlight anything in the 800 sq. ft studio – from the latest droolworthy recording gear to the next rising pop star! If smart, energy-and-cost-effective solutions are your jam, then don’t miss this week’s Flex II LED Track Lighting sale! Here’s a bit of trivia for those of you who plan to watch the Times Square ball drop tonight: The LEDs inside the iconic sphere are brought to us by Philips – which happens to be the same manufacturer of the 96 diodes inside the Genesys 3.0 LED T8 Tube. The Genesys is a 4 foot fluorescent tube replacement, designed and assembled in the USA exclusively by LED Waves. We picked Philips based on the brand’s quality, and specified the Luxeon M line for its highly consistent flux and light color – traits which were sorely lacking in LED T8s we’ve seen from market competitors. This consistency between LEDs to another is assured by the line’s Freedom from Binning program. And speaking of Freedom, we also offer two driver options for you to choose from (20W and 38W), depending on your lighting and power needs. Both versions of the Genesys provide more useful lumens than a fluorescent tube, due to the directionality of LED light. Enjoy dropping that knowledge bomb on your fellow partygoers tonight, as the LED ball drops! Have a great New Year. Guess That LED Light Bulb! Can you guess which one of our light bulbs is built with this part? Hint: Not only is it eligible for inclusion in our James Turrell giveaway, it’s also one of our many American-made LED PAR lamps on sale, 15% off through August 12th! Cicada season is soon to hit the east coast, and Radiolab has posted these neat instructions for a DIY Cicada tracker. These buzzers have spent the past seventeen years sleeping and snacking in soil throughout the southern United States. Once this soil reaches 64° F, the cicadas will emerge and begin their journey up north. The detector will flash LED lights to signal the coming Swarmageddon. You’ll need about $80 worth of materials to make the Cicada Tracker; and local folks can build theirs at one of these hands-on workshops hosted by WNYC. This seems like a rich educational experience for kids, lots of nerdy fun for LED fans (bonus: the LEDs will still be functional for the next Swarmagedden, in 17 years), and just a great activity for any cicada enthusiast who is just sick-a-da waiting. After noticing drastic changes in the colors in his artwork under a particular LED light bulb, Dennis Tawes is now experimenting with a new style of painting. Rather than lighting the subjects of his compositions, Tawes projects a beam of LED light onto his canvas and adjust the colors of the paint he applies according to the distorted hues. This is particularly interesting to us at LED Waves because it never would have happened if Tawes had better quality LED bulbs with high Color Rendering Index. Go figure: a market for low-CRI LED lighting. This past Tuesday saw the launch of the Bay Lights, the world’s largest LED light sculpture to date. Made for the San Francisco-Oakland Bay Bridge by superstar of the medium Leo Villareal, the 1.8 mile wide installation consists of 25,000 LEDs playing out a soothing nighttime light show. Speaking to the efficiency of LEDs, running this massive light installation will cost approximately $15 a night – which has been covered by solar credits. This $8 million project was made possible by donations and is expected to bring $97 million worth of tourism to the surrounding area. Photos and videos of the twinkling LED lights are already trending all over; it seems the public art installation has quite a few admirers that will be sad to see it go. The lights are going out on the Bay Bridge in two years. Grand Central Terminal had a grand centennial last week as it was treated to an LED light show by Improv Everywhere! 135 participants took over three floors of catwalks lining the west wall of the concourse. Clad in black, with a color-changing LED flashlight in each hand, the Improv-ers performed a choreographed dance to a prerecorded narrator via wireless speakers. Tools of the trade. Image via Improv Everywhere. GCT commuters and outside passersby on Vanderbilt Avenue were captivated by the dancing red, green and white LED lights. This wasn’t Improv Everywhere’s first performance in the iconic terminal; six years ago the merry pranksters charmed and confused the public with Frozen Grand Central. Read more about how Improv Everywhere pulled this off at their site. Want to put on your own LED light show but don’t have 270 flashlights and 134 other friends? Check out our color changing, programmable LED wall washers and our DMX RGB LED controllers! Last year a widely circulated study erroneously pointed to LED lighting as the cause of degrading artwork in museums. 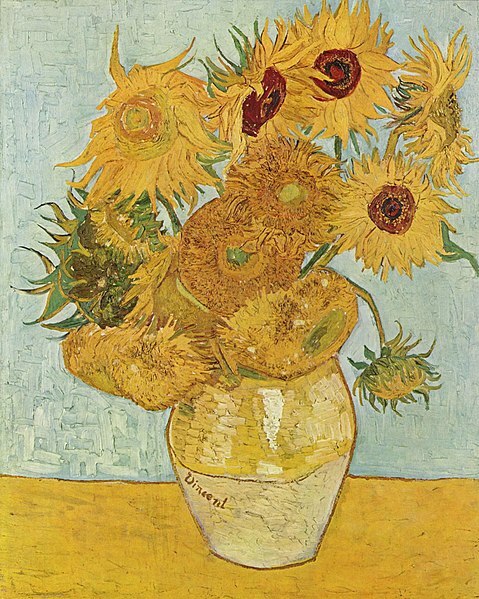 A group of researchers at Belgium’s University of Antwerp measured changes in color in yellow lead/chrome-based paint used by Vincent van Gogh and his contemporaries. A browning effect was observed in paint exposed to a particular wavelength – one that was not produced by an LED light! Do not irradiate under high intensity Xenon lamps! It’s unknown why the original Antwerp research team pointed fingers at LED bulbs in such an irresponsible way, or how damaging this was for the widespread adoption of LED technology. A formal retraction of this study, however, would be like music to van Gogh’s… ear.